Medicine of Cycling is pleased to announce the Call for Abstracts for this year’s medical conference to be held September August 22-24, 2014 in Colorado Springs, CO. If you are a researcher and are interesting in presenting at our conference, we invite you to submit your original research papers now through May 15th, 2014. We encourage abstract proposals in a variety of areas, however, the abstract must be relevant to cycling medicine. Both quantitative (including data) and qualitative (program descriptions, educational interventions, etc) are acceptable, but published data cannot be submitted. Submitted abstracts will be reviewed for relevance and quality, and highly ranked abstracts will be invited to give an oral presentation (limited to 10-minute presentation followed by a 5-minute Q&A). 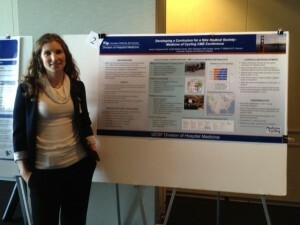 Some abstracts may be invited to provide a poster presentation. Research presentations are likely to occur on August 23rd. The waived conference fee is contingent upon presenting at the conference. Please include full author names, degrees and institutional affiliation if applicable. Authors of accepted abstracts will be asked to disclose potential conflicts of interests. Abstracts should be submitted via email to Alynn Kakuk, DPT at alynn@medicineofcycling.com. Members of the Research Task Force will be involved in the selection process. 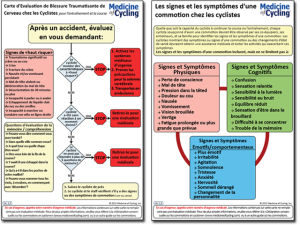 The "Concussions in Cycling Consensus Statement 2012" has been translated from the original English into French and Hebrew thanks to the generous contributions of the community. 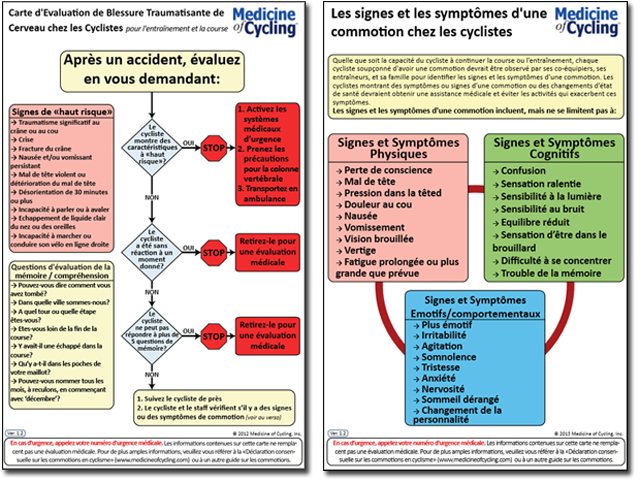 And the Concussions in Cycling Assessment Card has been translated into French, Portuguese, Hebrew and soon will be available in Spanish and Italian. Thanks so much to Paul T, Tomer G, Fabiano A, Wendy B and Marco B for their contributions! You can find the documents and all translations on the Guidelines page. Hotter-N-Hell Hundred Science of Cycling Symposium Aug. 23, 2013 – Free! Dr. Frank Wyatt is running a free "Science of Cycling" event at Midwestern State University in Witchita Falls, TX in conjunction with the Hotter-N-Hell Hundred ride. It looks to have some great faculty and topics. If you are in town for the HHH, be sure to check it out! 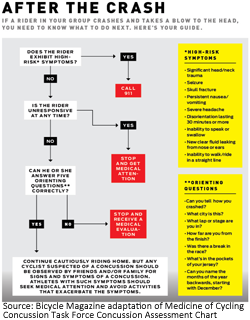 The Medicine of Cycling Concussion & Traumatic Brain Injury Task Force has put together a quick reference card and TBI evaluation flowchart. 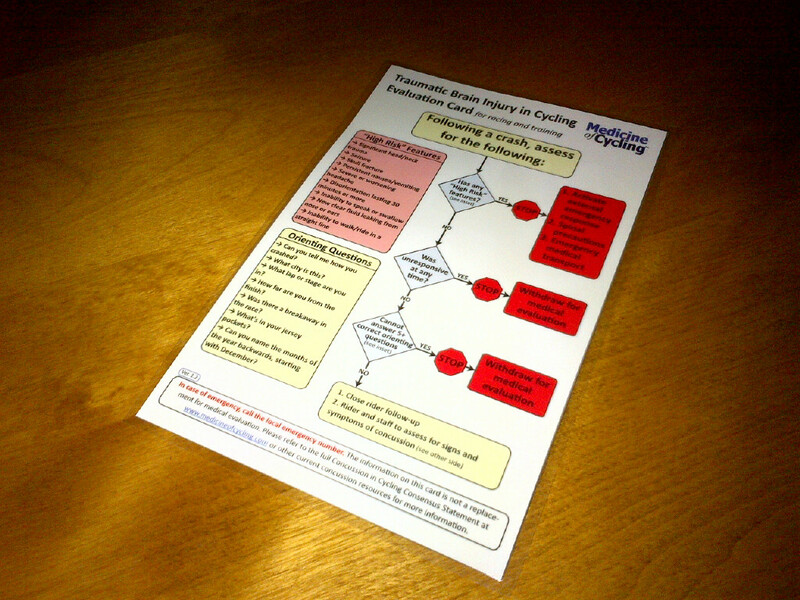 We had 500 printed up and laminated. These are going to attendees of the 2012 Medicine of Cycling Conference and we will be distributing several hundred via the USA Cycling Coaching Summit to be held this fall. They will also be available via our website shortly. Founders of Medicine of Cycling Conference, Drs. 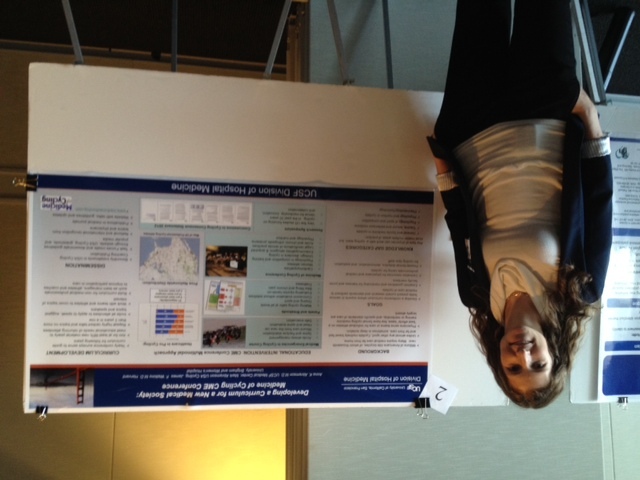 Anna Abramson, James Watkins, and Mr. Mark Abramson, presented a poster for UCSF Education Day describing their curricular planning structure for their work in cycling medical education. Kristin Wingfield, the physician for the Exergy-Twenty12 professional women’s team, explained that cycling is particularly unique when it comes to concussion management in that, unlike other sports, “there is no time out; there are no player substitutions.” Yet putting a rider who has suffered a concussion back into a race can be both harmful to the rider, who may be suffering loss of balance and cognitive function, and the riders around who are depending on her to hold a line, stay upright and exercise sound judgment when diving into corners and sprinting for the finish.